Well, we did it! 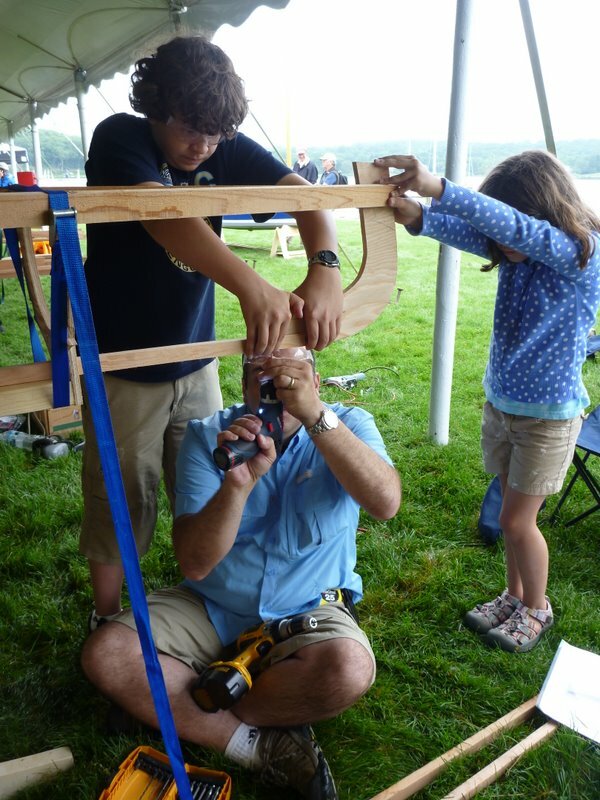 My family and I attended the 20th Annual Wooden Boat show in Mystic, CT and built our own boat over a 2.5 day period….My wife, 11 year old son and 7 year old daughter combined efforts with Dave Gentry, our excellent instructor, to build the Mystic Molly. 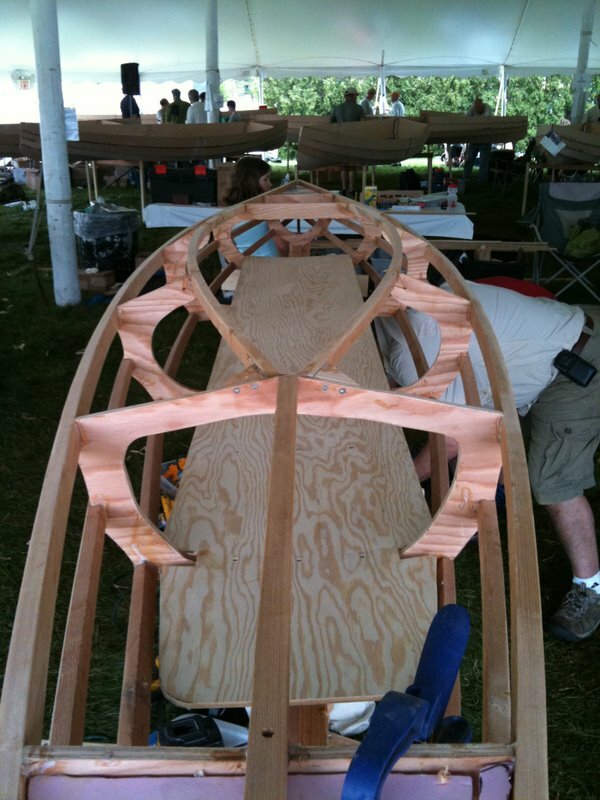 Named after one of our dogs and built using one of Dave’s designs (the Chuckanut 15) we progressed from pile of wood to framed and skinned boat in a long weekend. All she needs now is paint and her rub-rails and cockpit-coamings to be ready to hit the water. The trip was a great family bonding experience and we had a great time. 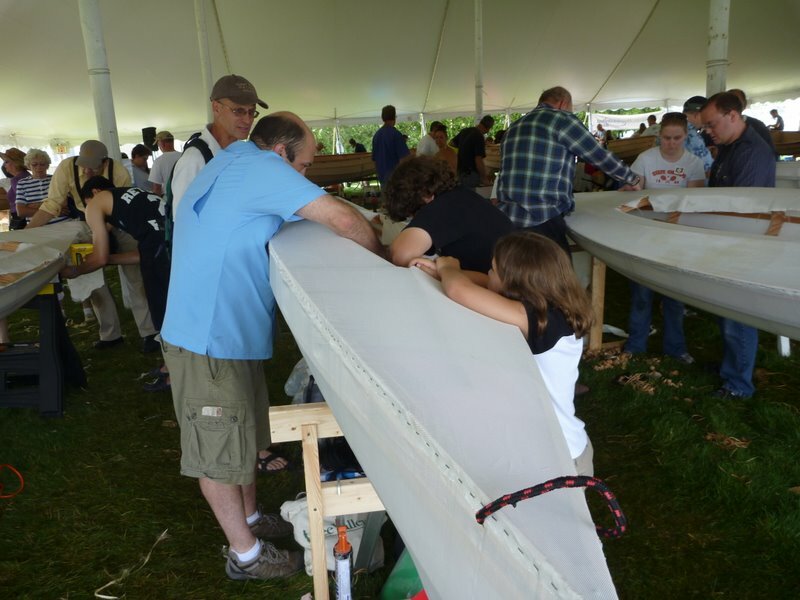 Weather cooperated and it was warm but not uncomfortable in the large outdoor tent where we built our boat along with 26 other families and about 5 other boat designers. 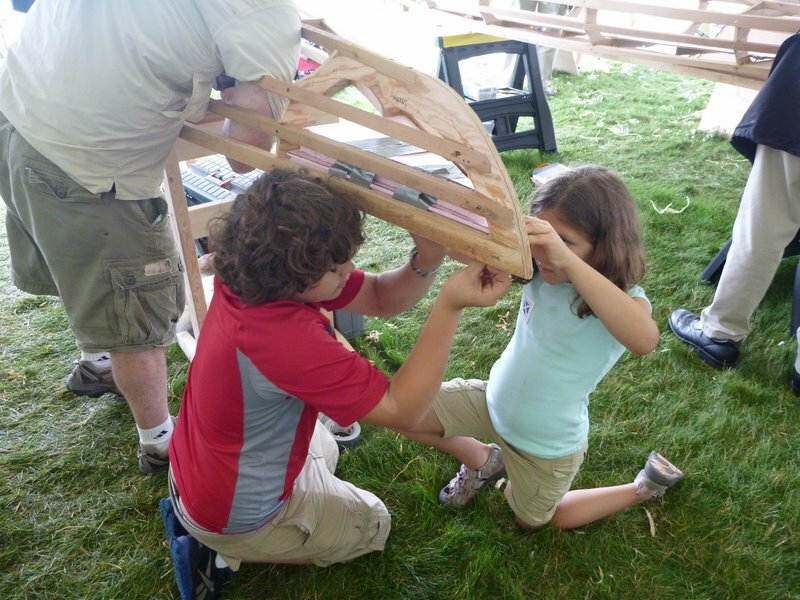 Five families joined us in building version’s of Dave Gentry’s Chuckanut. 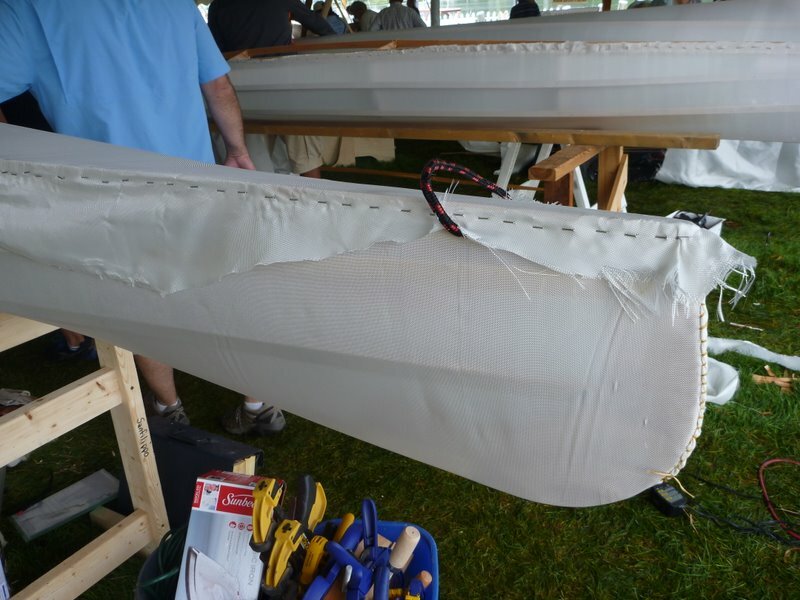 The Chuckanut was the only skin-on-frame boat (the others were mostly lap-stitch construction) that was offered for family boat-build, and that was why we selected it. I was very interested in learning this method of construction. 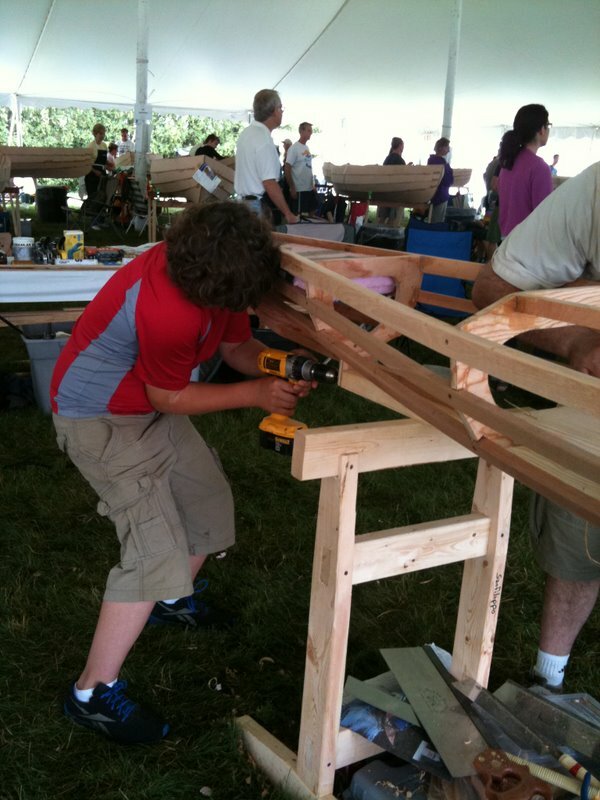 WoodenBoat magazine started Family BoatBuilding in 1998 as a way to bring new people to boatbuilding, and to boating. 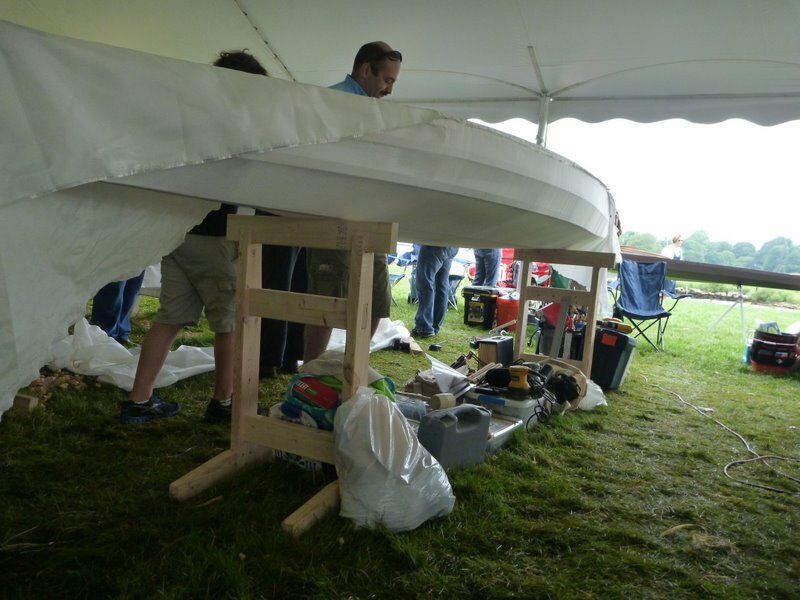 The concept is simple: To provide a kit that can be built in two-and-a-half days and provide expert building instruction. 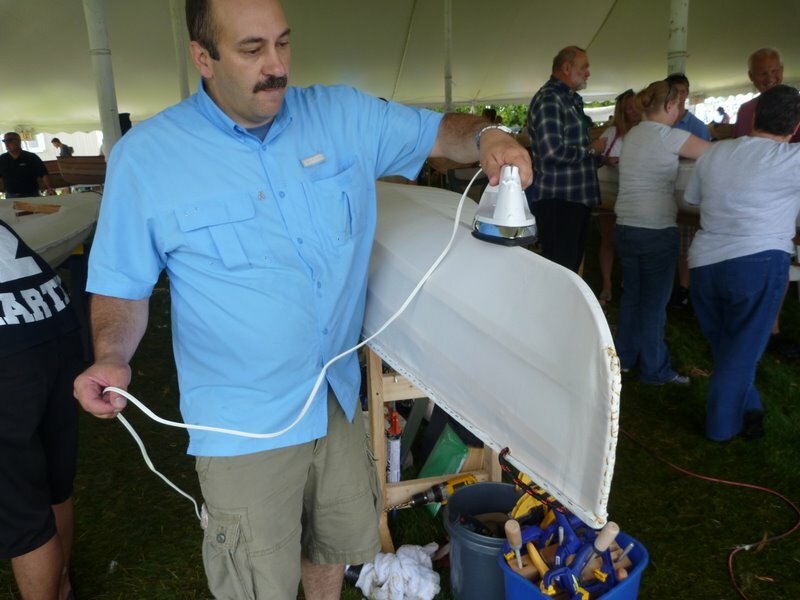 The goal is to launch all the boats into the water midway through the third day of the show. 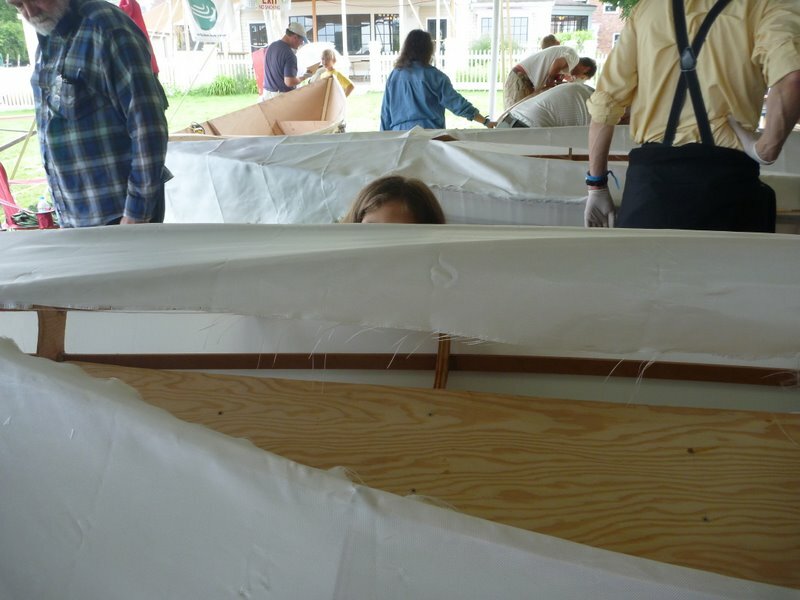 And then they put their boats on their cartops or trailers and take them home. Cool concept, and growing every year, I’m told. 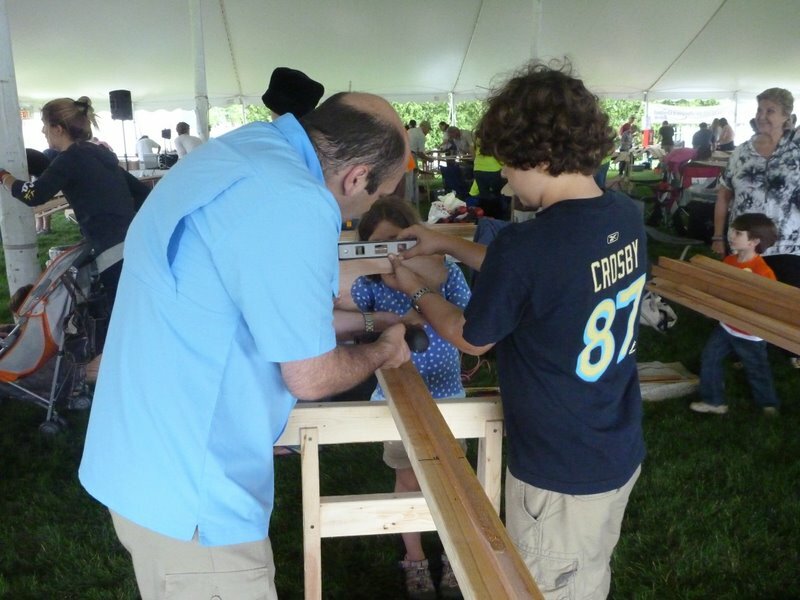 We will likely do it again next year, we had so much fun…do it with your family! 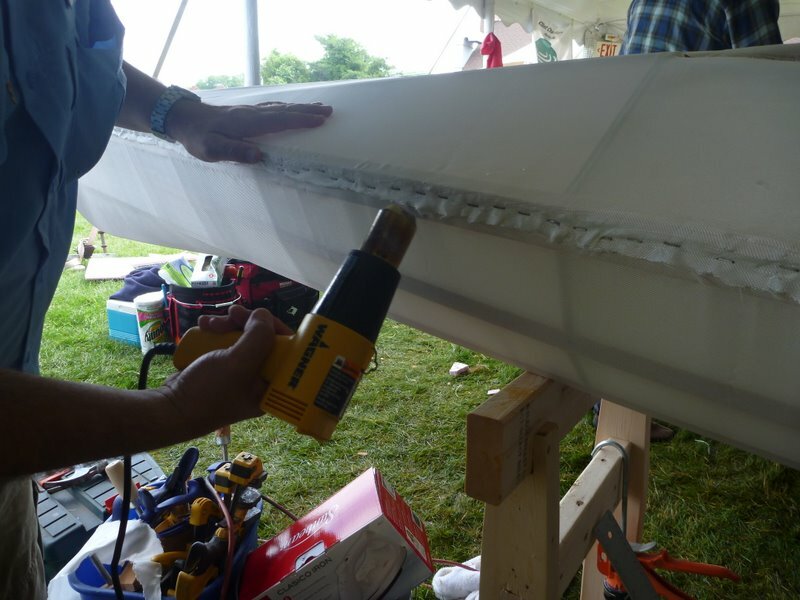 Its fun and the WoodenBoat Show itself as well as the Mystic Seaport Museum are both very much worth the trip. 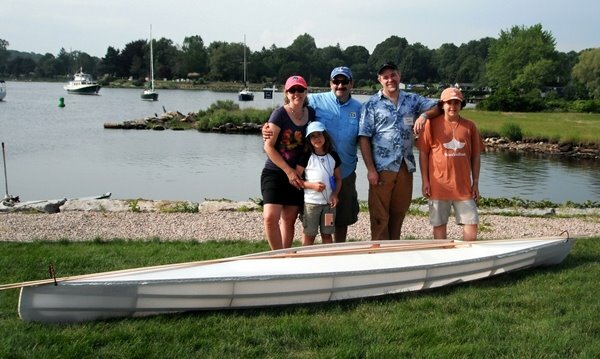 The Chuckanut 15 is an ideal family boat optimized for comfortable and relaxed use by paddlers of all abilities. The Chuckanut can be carried with one hand, cartopped easily, and launched and paddled on a whim—with no special skills or equipment necessary! 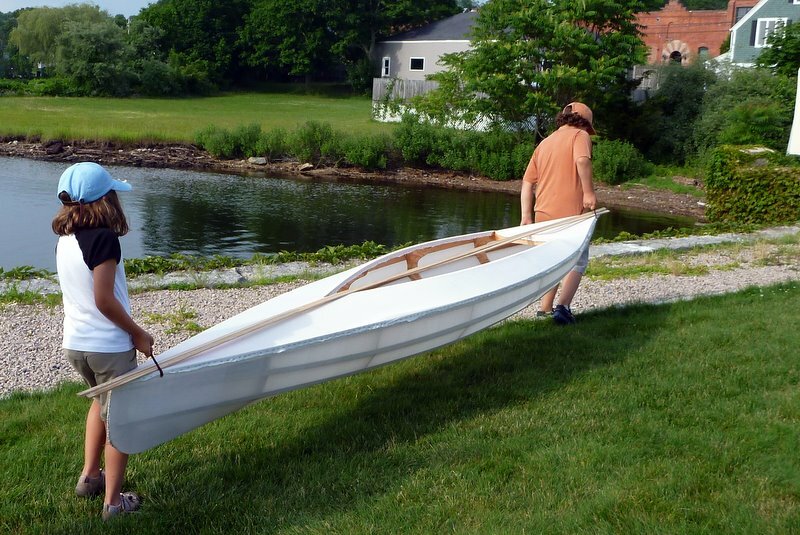 She’s a tandem, recreational style skin-on-frame kayak that can be paddled solo, or as a double, and has a fast, stable hull design which tracks well, but still turns easily. She has a large open cockpit, with stowage and floatation in the ends. The Chuckanut is designed for messing about on ponds, lakes and bays, and is great as a day paddler, or protected water expedition boat. I will post photos again as soon as the Mystic Molly is painted and in the water. 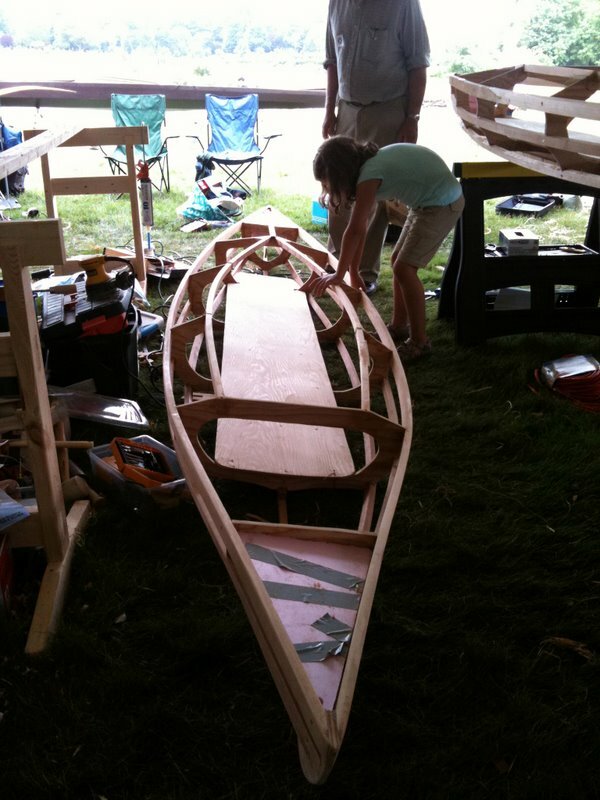 Posted on July 12, 2011, in Kayaks & Boats, Travel, Woodworking. Bookmark the permalink. 4 Comments. Wow, Matt, this is very cool! Thanks for sharing.